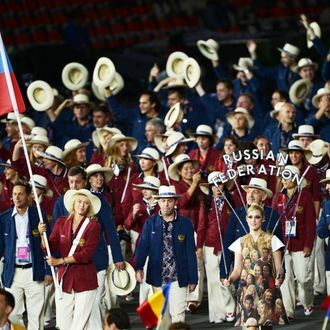 The Russians at the opening ceremony of the London 2012 Olympic Games. The World Anti-Doping Agency released a report alleging that Russia’s top athletes were involved in a large-scale doping program sanctioned by the Russian government. The report recommends lifetime bans from international competition for a number of Russia’s leading track-and-field athletes, including one who won the gold in the 2012 London Games. In addition to individual bans, the report by WADA recommends banning the Russian Athletic Federation from competing in the 2016 Summer Olympics, to be held in Rio de Janeiro. The findings have been submitted to global law-enforcement body Interpol, who have launched an international criminal investigation into the matter. The report alleges a “deeply rooted culture of cheating at all levels” was at play, and that the conspiracy stretched from the Kremlin to the halls of the International Association of Athletics Federation, the governing body for global track-and-field competition. According to the report, trainers, coaches, scientists, agency administrators, and secret police coordinated to destroy samples, bribe officials and clinicians, and alert athletes of upcoming testing. Police officers present during blood work and testing created “an atmosphere of intimidation” to keep athletes and technicians in line. The German documentary Top Secret Doping released last year helped call public attention to the issue. Meanwhile, former IAAF head Lamine Diack is now under criminal investigation for receiving more than $1 million in bribes from the Russian Athletic Federation.